Volunteers load surplus milk purchased by the USDA into cars at a special distribution day in St. Louis. Harvest Public Media's Jonathan Ahl explains why there's a "perfect storm" when it comes to an oversupply of meat and dairy. A combination of factors have led to this: increased production, flat demand despite near-record consumption of milk and cheese and trade issues. And in the long run, it’s unclear whether market forces will get production in line with demand. “It’s a perfect storm,” said Corey Rosenbusch, president of the Global Cold Chain Alliance, a trade group representing the industry. According to the U.S. Department of Agriculture, the average American is projected to eat 220 pounds of meat and consume more than 200 pounds of milk and cheese this year. That’s near the records set in 2007, right before the recession. Production never stopped, though. It increased, despite the fact that demand is only now returning to pre-recession levels. On top of that, prices are low and the meatpacking and dairy sectors are increasingly efficient. Bill Roenigk, an agricultural economist who works for several meat companies and trade groups, said producers are really only looking at one thing — the bottom line. On the dairy side, Roenigk said government subsidies and increasing demand for cheese is propping up a business that is seeing milk demand slide. Other industry analysts say the situation is unsustainable. Production has been outpacing demand for long enough that a breaking point is coming, University of Missouri ag economist Scott Brown said. Chicken and pork are the industries most likely to nimbly change, Brown said, as chickens and pigs reach slaughtering age much quicker than cows. It’ll take the beef industry longer to curtail production. Brown also said trade issues may be the wild card, such as the Trump administration’s tariffs on chicken and the changes to the North American Free Trade Agreement that has reduced exports to markets, including China and Mexico. The extra meat and dairy has helped one segment: Food banks and the people they serve. The USDA is buying 250 million pounds of meat and 65 million pounds of cheese and milk — mostly because of the tariffs — and distributing it to food banks. The St. Louis Area Foodbank recently received so much additional milk that they scheduled an extra distribution day to hand out half-gallon jugs of whole milk to more than 100 cars lined up in a vacant parking lot. Gooden said the food bank is scheduled to get a similar delivery of meat in April. “We’ll take whatever they can give us. 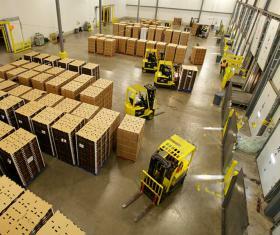 We just get a little more creative in how we distribute it,” Gooden said. Not to mention, there’s been some relief to the food pileup. China has had to kill millions of hogs due to an outbreak of African swine fever, leading the country to buy 23,000 tons of U.S. pork despite a 62 percent tariff. That’s meat that would have otherwise gone into cold storage or to food banks.